The new HBO movie, Recount, is a sadly funny primer on all the behind-the-scenes shenanigans that occurred during the infamous 2000 Florida voter recount. Seen primarily through the eyes of Ron Klain (Kevin Spacey), General Counsel to Al Gore's recount committee, it is more affectionate to the Democrats. But in retrospect, it is hard not to be, eight years later, as George W. Bush has the dubious distinction of having the lowest domestic approval ratings of any sitting American President in history. And that's including Nixon. Jay Roach, of Austin Powers and Meet the Parents fame, directs the ensemble cast to what are some highly accurate caricatures of some of the major players in the unfolding comedy of errors taking place. I say caricatures because tongue is firmly planted in cheek as he surveys some of the notable incidents throughout the aftermath of the election. John Hurt (The Elephant Man) portrays former Secretary of State, Warren Christopher, as a dignified individual whose sense of decorum unfortunately delays Gore's recount team from fighting dirty earlier in the game. Ed Begley, Jr. (St. Elsewhere) plays David Boies, counsel to Gore in the Supreme Court case, Bush v. Gore, as a cavalry general coming to the rescue. If he is unable to stop Bush's recount committee from getting their way, it is simply because their leadership was simply more motivated to win. Their leader, James Baker, former Secretary of State and part of the Bush Family inner circle, is given ferocious life by virtual lookalike Tom Wilkinson (Michael Clayton). Wilkinson's Baker shows up to his first meeting with Gore's recount committee ready for a street fight, to the chagrin of Hurt's more gentlemanly Christopher. This sets the tone for the long battle that follows. Of particular note is the performance of Laura Dern (Jurassic Park) as Katherine Harris, then-Secretary of State of Florida. Her delineation of Harris fits in with the image we remember, a preening and opportunistic evangelical Christian eager for her chance in the spotlight. With no concern over charges of conflict-of-interest, she was only to happy to take center stage in certifying Bush's victory, despite her post as Bush's Florida campaign co-chair. 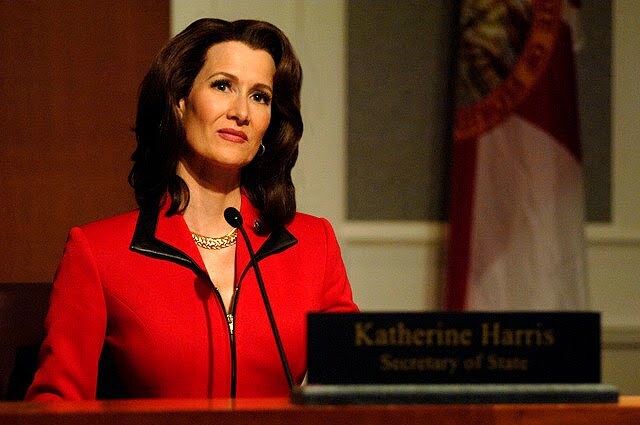 Dern's excessive makeup, gaudy attire, and padded form (Dern's slender body is far different than the shapely Harris') remind us of how ubiquitous Harris' face was on TV, at the time. With loads of incidents to poke fun at (or cry over depending which side of the political aisle you're on), from Gore's retraction of his concession to Bush (which may have been the impetus for the Bush committee's tenacious fight), to the U.S. Supreme Court's unprecedented admonition that their decision on Bush v. Gore was unique to this specific case, Recount makes for entertaining, but biased, viewing.